It’s 06:50, all I hear are IV’s that are alarming, a detoxing kid screaming obscenities in the next room, and the early morning bustle of the nurses. Friday, Ladybug came home from school very lethargic, and by the evening had a super high fever. All Friday night and Saturday I kept waiting for the cause of this fever to appear. Nothing did. No sign of a virus, no runny nose, cough, vomiting or diarrhea. The high fever continued the entire long weekend. Tylenol only dropped it down to a low grade fever. 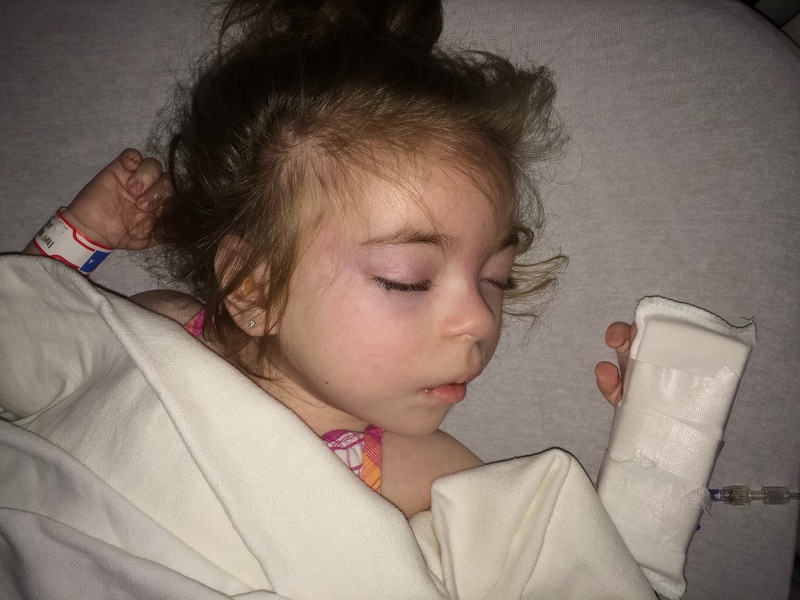 Her seizures typically increase when she’s sick, but this time was a whole new ballgame. Friday she had a Gelastic Seizure (laughing seizure)shortly after she came home from school. She hasn’t had one in at least a year or two. Then Monday evening she had her first of several tonic seizures. Tonic seizures are pretty uncommon and are typically seen in those who have Lennox-Gastaut Syndrome, which is the rare seizure disorder that Ladybug has. During a tonic seizure, all the muscles contract and the entire body stiffens. It is unbelievably heartbreaking to see her tiny fragile body stiffen up like it did. Her eyes went blank and she disappeared for what seemed like hours. In actuality it was only about 15-20 seconds. Yesterday, she was admitted to the children’s hospital. It is currently a pretty busy place, and there are no beds available upstairs on the ward. Not a single one. Oddly enough I’m quite happy in the ER dept right now. There is always something going on and the piece de resistance is that we have a private room down here. As of now there are no explanations for the fever. Labs are good, the possible pneumonia was ruled out as was a kidney infection. Ladybug is sleeping soundly now and I’m thinking I might have a quick cat nap before rounds too. I’ll post when I know more. ← In Honour of Rare Disease Day – Help Me Get CDG Recognized as an Official Day.